TSIM SHA TSUI, Hong Kong--(BUSINESS WIRE)--Leading international toy and consumer products company, ZURU™, announced today that it has prevailed in its patent infringement action in the United States District Court for the Eastern District of Texas against Telebrands and subsidiary Bulbhead.com, LLC, together one of the largest U.S. telemarketing companies. 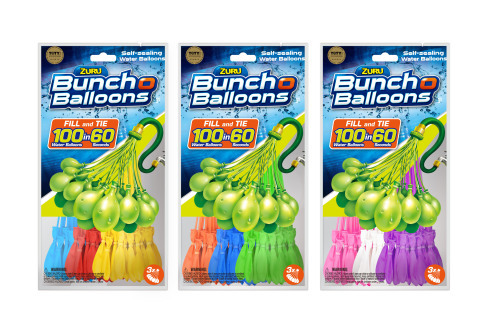 A jury verdict in favor of plaintiffs ZURU Ltd. and Tinnus Enterprises Inc. found that Telebrands Battle Balloon product line, including Balloon Bonanza HD and Battle Balloon Color Burst willfully infringed U.S. patents 9,315,282 and 9,242,749 covering acclaimed ZURU Bunch O Balloons, awarding lost profits and reasonable royalty damages in the amount of $12,250,000. ZURU has seen international success since the launch of the original Bunch O Balloons product, shipping more than 3 Billion balloons last year worldwide and winning the 2017 Outdoor Toy of the Year in the U.S., the 2016 Australian Toy of The Year and the 2016 Nuremburg Toy Award. ZURU has obtained three previous preliminary injunctions against Telebrands to bar U.S. sales of their “Battle Balloons,” “Balloon Bonanza” and “Easy Einsteins” products. ZURU has two additional cases against Telebrands, one involving the “Balloon Bonanza” and “Easy Einsteins” products. “The jury served justice today. Telebrands is infringing on our intellectual property and has received a strong message that this conduct will not be tolerated,” said Greg Smith, General Counsel, ZURU. Lead counsel in the case was Thomas Dunlap and Cortland Putbrese, for Dunlap Bennett & Ludwig PLLC of Vienna, Virginia, assisted by lead local counsel Eric Findlay of Tyler, Texas law firm Findlay Craft. ZURU is a disruptive and award-winning company that designs, develops, manufactures and markets innovative toys. Inspired by kids and imaginative play, ZURU is one of the fastest growing toy companies and is known for their agility, creativity and new-age manufacturing techniques. The company employs more than 400 staff, has 10 offices and supplies most major retailers in 120+ countries. ZURU has delighted millions of families all over the world through partnerships with entertainment properties, including Nickelodeon, Disney, Universal Studios and DreamWorks as well as successfully building their own global brands such as Bunch O Balloons™, ZURU Fidget™, Mayka™, X-Shot™, Robo Alive™, Micro Boats™ and Hamsters in a House™. Let’s reimagine play, everyday! Visit us at www.zuru.com, Like us on Facebook @ZURUToysCompany, or Follow us on Twitter @ZURUToys.